The Global Automotive Industry consists of all companies and organizations involved in the design, development, manufacturing, marketing, and selling of motor vehicles. In 2012, more than 84 million vehicles were produced globally by the industry as a whole. The biggest car brands in 2011, in terms of vehicles sold, were General Motors (9.03 million), Volkswagen (8.156 million) and Nissan/Renault (8.03 million). The 10 biggest auto manufactures sold more than 56 million vehicles combined. 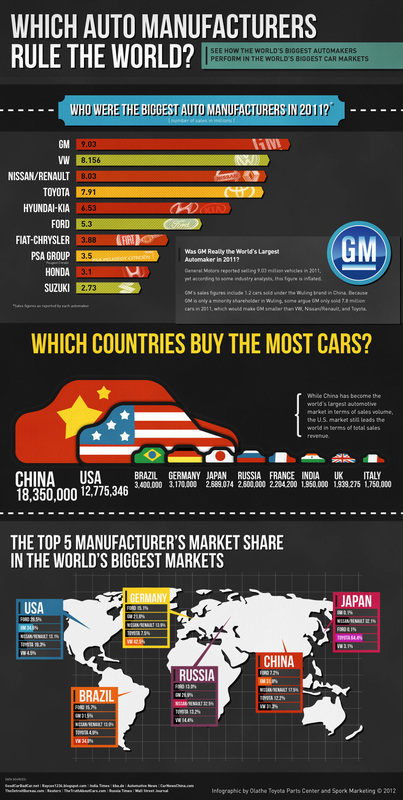 China and the United States are by far the biggest auto markets in the world, with 18.3 million and 12.8 million vehicles sold in 2011 respectively.